In 2006 Dr. Phil Senter published two scientific papers in which he stated that non – avian theropods have ventral facing glenoids. He cited Carpenter (2002) as support for this hypothesis. The two scientists cited many dinosaur fossils, but very few maniraptorans. There is only one specimen that Senter cited that is nearly articulated, that appears to support his hypothesis, and that is derived enough to be relevant to Microraptor. That specimen is the oviraptorid pictured here. This specimen was mentioned and figured by Larson and Rigby (2005). They refer to it as Ingenia, but no catalog number or museum is given. Casts of this specimen are easily found for sale on the internet, where it is listed as Conchoraptor. 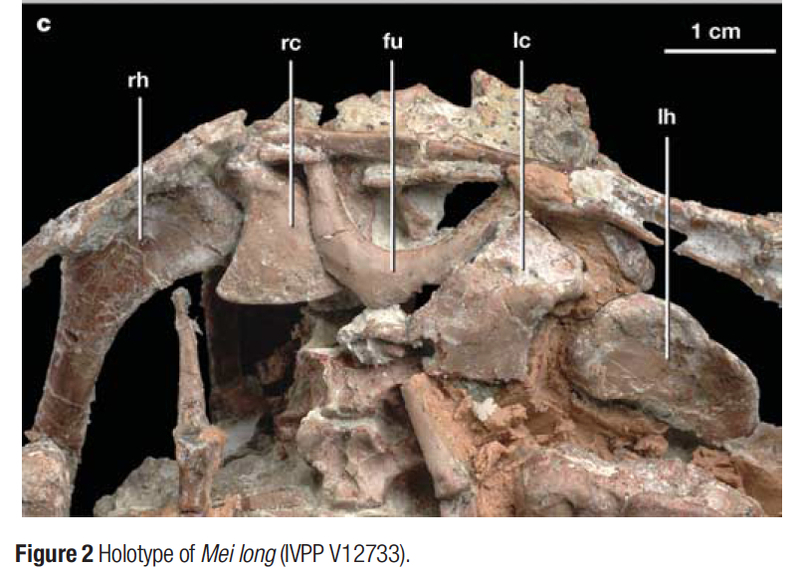 It is flattened dorsoventrally, so that the ribs and ilia have rotated to lie flat (best seen below) but it does seem to support Senter’s ventral glenoid hypothesis. The two coracoids do appear to overlap at their sternal processes, which indicates that they are displaced, yet the furcula is nearly articulated with the acromial processes of the scapulae. The sternum cannot be seen, so we cannot tell if it articulates with the coracoids at all. I decided to try a minor experiment. I manipulated my model of Microraptor to see if I could articulate its pectoral girdle like this. I rechecked the proportions of my Microraptor skeleton replica against the specimens of Microraptor zhaoianus described by Hwang et al. (2002) and a couple of other specimens. It turns out that there is a pretty wide range of proportional diversity among specimens of Microraptor themselves, with some ratios varying by nearly 33%. 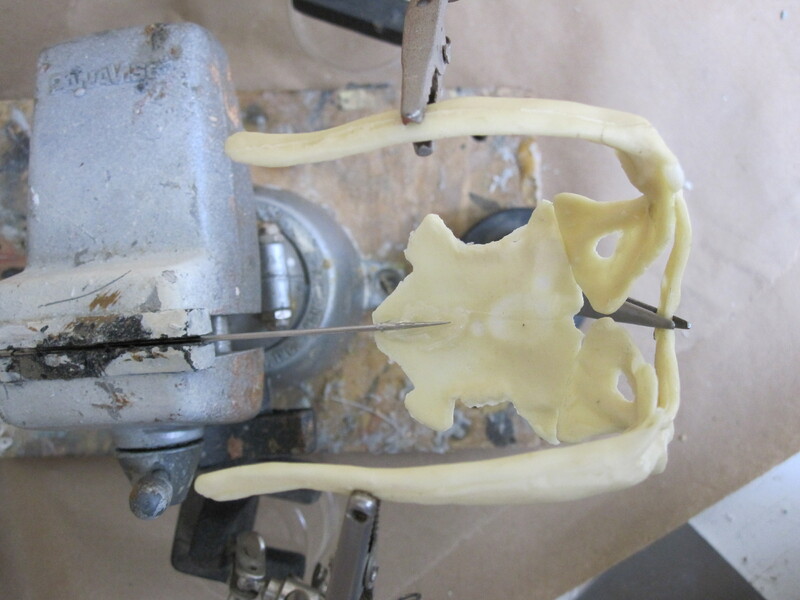 But once my proportions were confirmed to be within this range I set about assembling the ventral glenoid configuration of Senter and Carpenter. Anterior view of the ventral glenoid configuration, after Senter (2006). 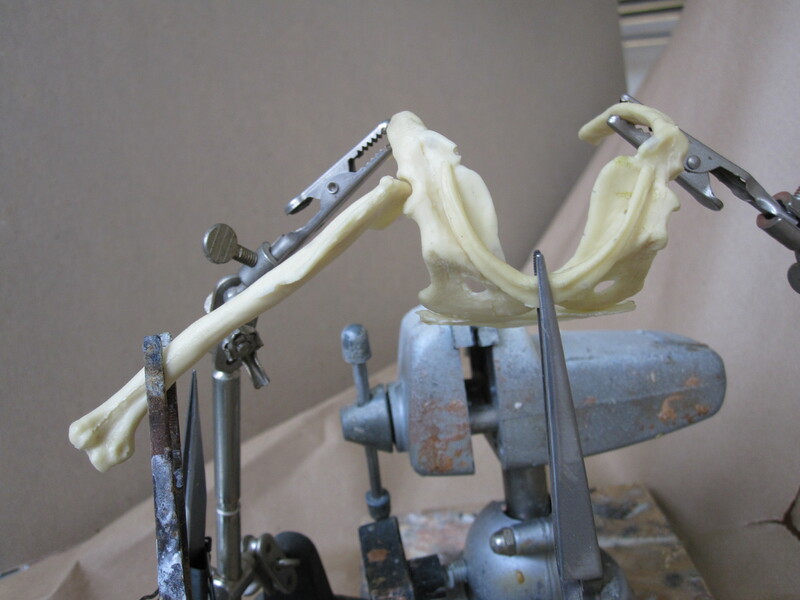 The coracoid foramina in my sculpt are asymmetrical, and you can really see it in this position. That is just a sculpting error, it does not reflect the real anatomy. It looked possible. By dislocating the coracoids and having them contact the sternum only at the posterior coracoid processes I could make it look a lot like the oviraptorid above. That was until I tried to place the furcula. The furcula of Microraptor is not like that in the oviraptorid cited by Senter. It is not as broad and it is more sharply angled. It cannot reach the acromion in this configuration, it can only reach the dorsomedial rims of the coracoids. 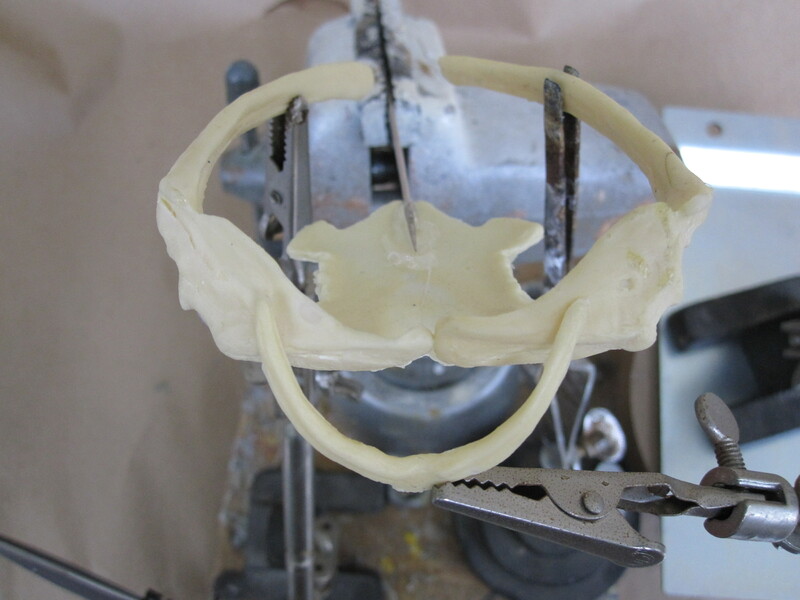 Therefore I rotated the coracoids until the furcula contacted both acromia. 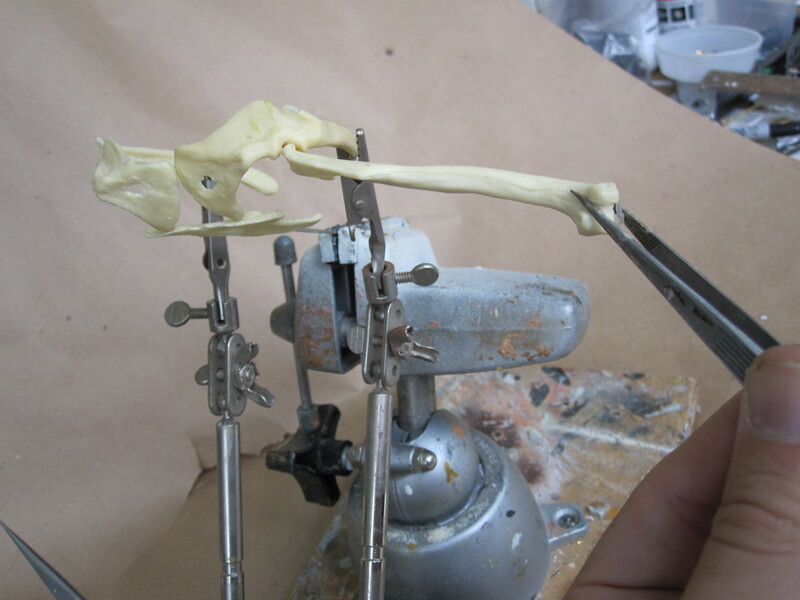 This configuration strongly resembles the type specimen of Mei long, which also has a furcula much more narrow than that of the oviraptorid above. The figure below is reproduced from Xu & Norell, Nature, 2004. Moreover, this orientation makes the glenoid face laterally, as Xu and Norell have noted in several deinonychosaur species. 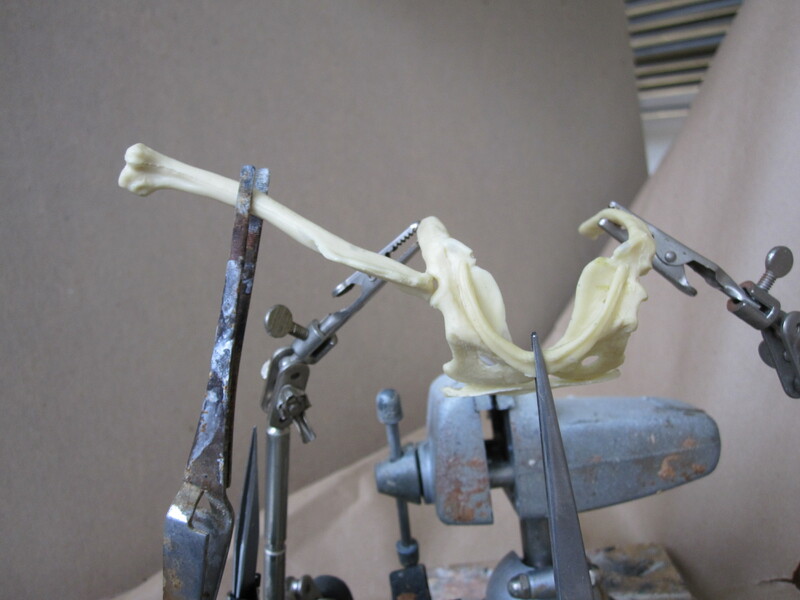 In my model his orientation seems to allow the elevation of the humerus above the horizontal. Parsons & Parsons (2009) suggested that Deinonychus could also elevate its humerus above horizontal. Gishlick (2001) ruled this out for Deinonychus on the basis of its glenoid morphology. The elevation of the humerus above the horizontal has also been ruled out because dromaeosaurs lack a triosseal canal and the corresponding supracoracoidal pulley system. Yet Sokoloff et al. (2001) found that, even with surgically destroyed supracoracoideus muscles, starlings could still raise their humeri to 50 degrees using just their deltoids. Also, modern birds rotate their humerus around its long axis by 70 or 80 degrees during the flight stroke, and doing so in Microraptor’s humerus elevates the elbow above the glenoid. 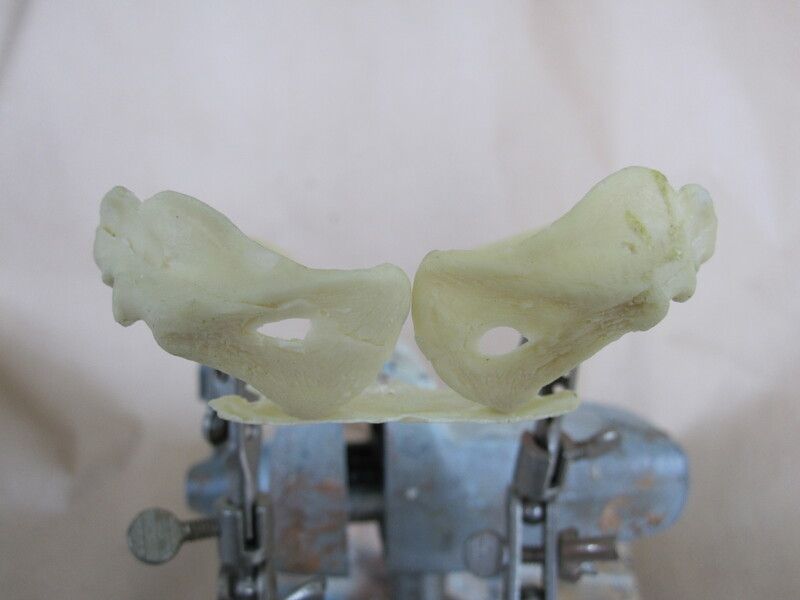 Position number 3 in Gishlick (2001) also brings the elbow above the glenoid. I haven’t examined the glenoids of Deinonychus or Bambiraptor, but I’ll conclude for now that it is probably more conservative to reconstruct Microraptor with a humerus that is at or not too not far above the horizontal. I also looked at other oviraptorids to see if they may have had a specialized pectoral girdle that is especially broad and which has ventral genoids. The specimen below proves otherwise. 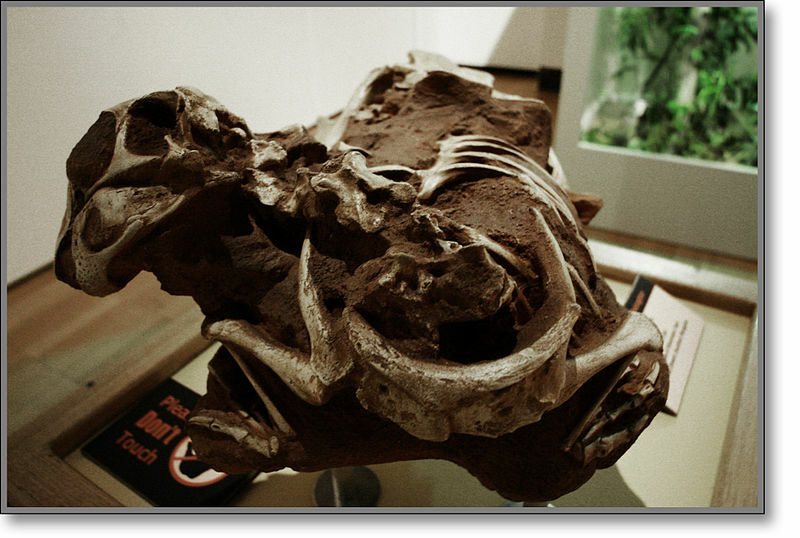 It is Citipati, IGM 100/1004 reproduced from Erickson et al. (2007). You can easily see that the scapulae lie close to the vertebral column, that the left ramus of the furcula lies in contact with the scapula, and the left glenoid is lateral. The first oviraptorid specimen that I pictured above is still puzzling. I wish we could see its left shoulder and the sternum. 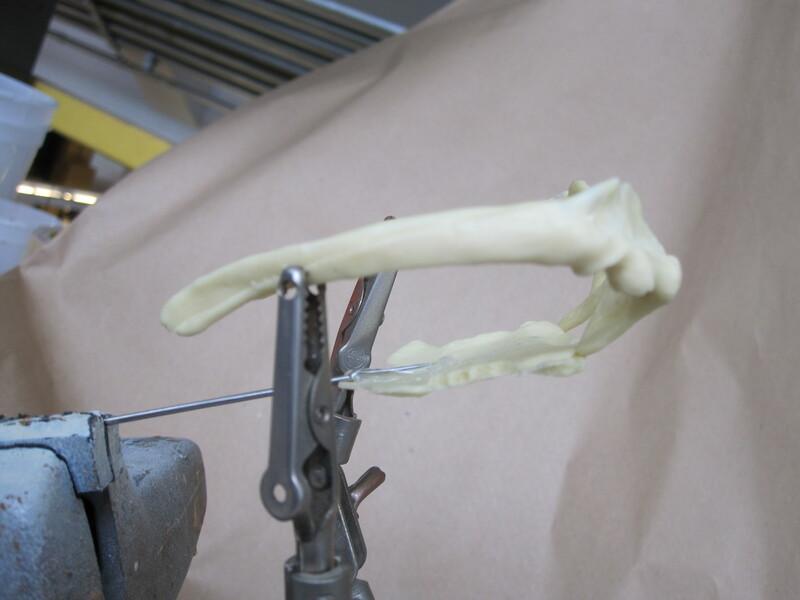 Perhaps the furcula underwent diagenetic distortion, or perhaps it is reconstructed with plaster. The latter is certainly possible since the specimen may be owned by a private fossil dealer or collector. Carpenter and Senter make good points. 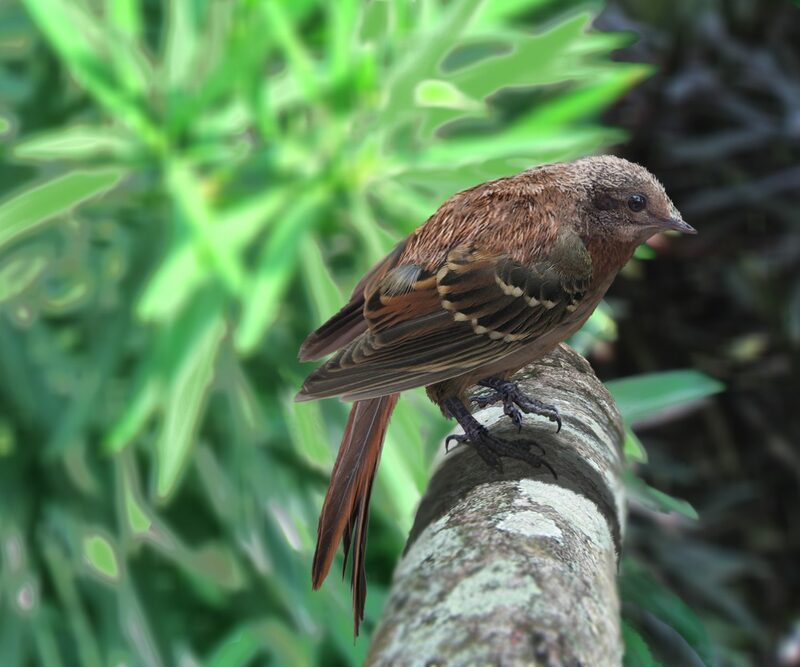 Carpenter pointed out that, even though we acknowledge that birds evolved within the theropod radiation, we must be careful not to assume, without positive evidence, that unknown or unclear aspects of their anatomy are the same as in modern birds. That is absolutely true and it should be borne in mind by all workers in the field. 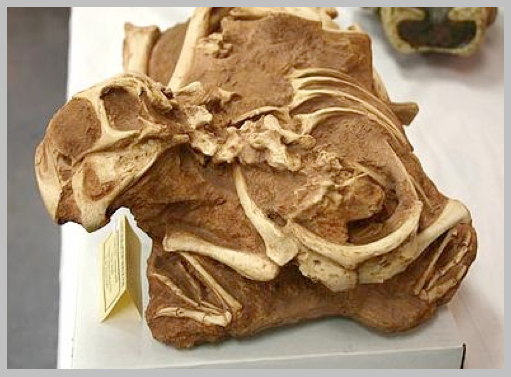 Still, in the five years since Senter’s 2006 papers came out, and the nine years since Carpenter’s was published, a wide array of new maniraptoran specimens has been reported, and the overwhelming preponderance of evidence seems to contradict the ventral glenoid hypothesis. Though far from identical to modern birds, maniraptorans seem to have had lateral glenoids and dorsal scapulae, just as Norell, Makovicky, Xu, Currie, Jasinoski, Paul, Baier, Gatesy, Jenkins, the Parsons, and many other researchers have documented. ← What does “Soft Dinosaurs” mean? Careful with articulated, dorsoventrally flattened specimens! How the ribs are still connected when they get squished can have a huge influence on the scap position. 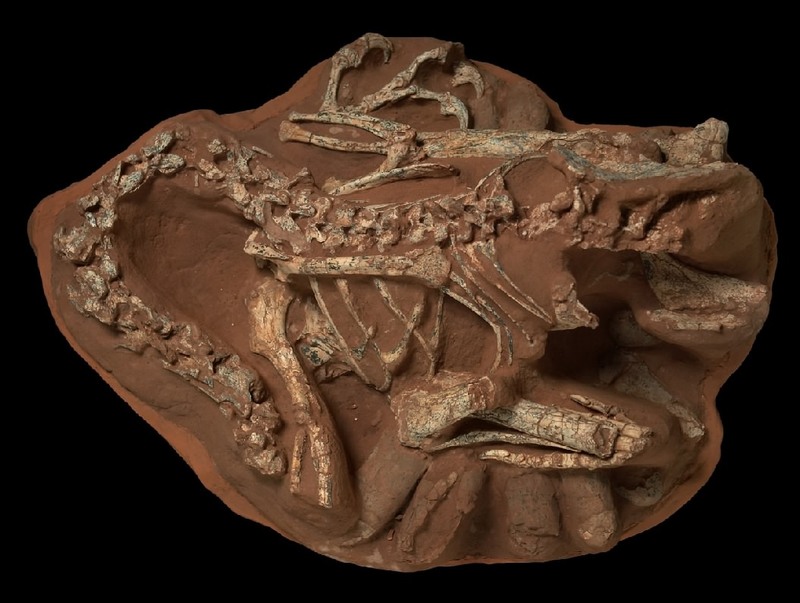 Extreme example: in SMNS F33, a Plateosaurus from Trossingen, the ribs slid back and in, making the body very narrow, the coracoids overlap medially(! ), and the scapulae stick up vertically. Consider that the privately held (as indeed it is) specimen Senter noted has overlapped coracoids: consider forcing overlap to see if the furcula might fit (with the caveat that the shape of the furcula differs). 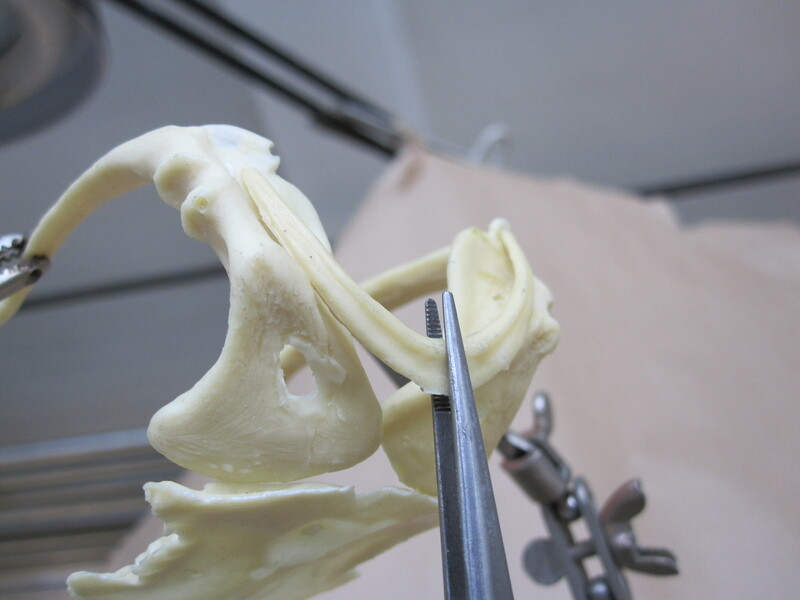 Additionally, distortion due to compression of the body may result in displacement of the scapulae and thus coracoids and possible life arrangement of the coracoid in the oviraptorids, even Citipati. In the latter, the scapula is practically at the rib/vertebra joint, while the other scapula is visible in lateral view, implying disarticulation prior to burial, which further confuses the articulation.